Six LED lights, two per stair, were pre-wired and tested before the top-decking was installed. Removal of the old wooden top-decking and lattice revealed an existing framework in relatively good condition. 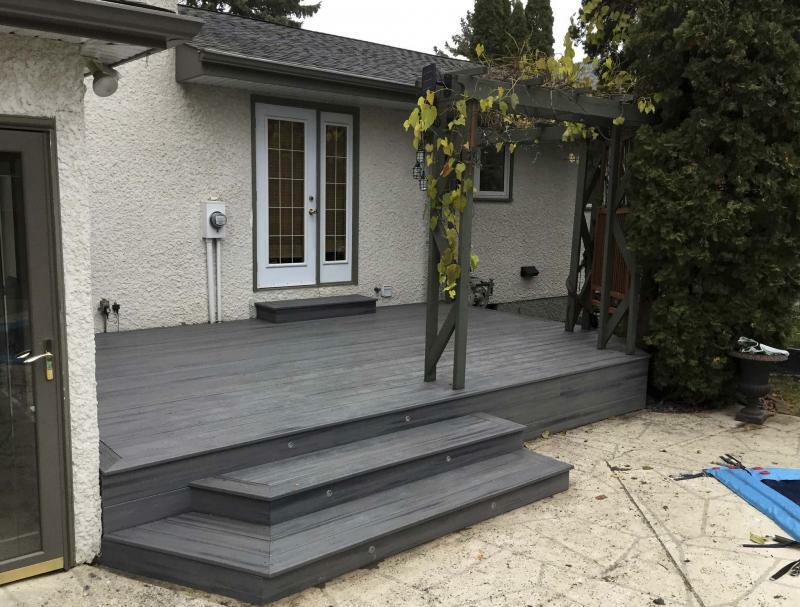 Seen here is the final product: a single-tiered deck with grey TREX top-decking and fascia, with the existing trellis recycled. Composite material was used to replace the old wooden top-decking, which had begun to rot and split. In any industry, forging good relationships with the people with whom you do business on a regular basis is both practical and essential. 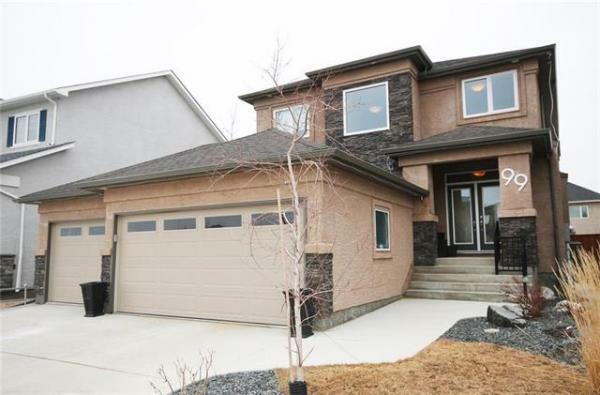 As a contractor, I rely on my suppliers to provide me with the materials required to complete a project. But every so often, the tables are turned. In the fall of 2016, I received a call one afternoon from Dave Wyllie at McMunn and Yates Building Supplies on Pembina Highway. With a few projects on the go, I assumed the call was order- or delivery-related, regarding one of my job sites. It turned out Wyllie wanted to inquire about my availability to build a deck for a very good client of his, or, more precisely, reface an existing deck with a composite product. The project in question was a single-tiered deck, nearly two decades old. As such, the wooden top-decking and lattice below had begun to rot and split in several locations. The deck’s framework and support system, on the other hand, were in relatively good shape. 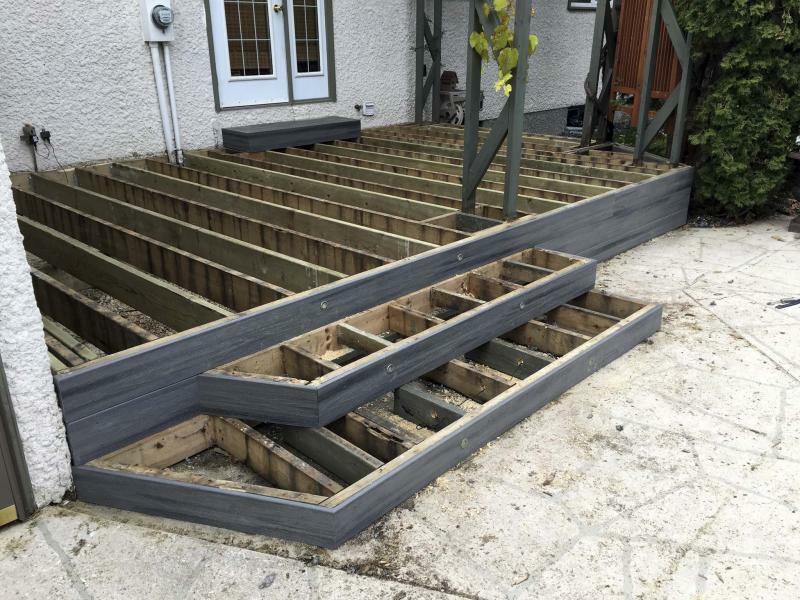 Therefore, this deck only required new top-decking and fascia, once the framework was beefed up slightly and a few minor footprint modifications to the original deck design were made. To ease the entire process, the existing top-decking and lattice would all be stripped away prior to my involvement, rendering this job very straightforward. After compiling the materials list for the composite required for the top and fascia, Wyllie arranged for the materials to be delivered to the job site the evening before I had arranged to start the resurfacing process. A light-grey TREX product was chosen for both the top-decking and the fascia. And as an added feature, six tiny LED deck lights would be wired into the fascia of the stairs to illuminate the pathway from the deck towards the in-ground pool, for those late-night swims. The first step was to pre-wire the lines for the lights, and run them towards the vicinity of the stairs with ample play in the wiring, so I could negotiate each light’s exact placement once the stairs were completed. Because the TREX top-decking would be fastened in such a way as to create an overhang look, the eight-inch fascia was first installed along the perimeter edge of the entire deck, as well as to the front of each stair. A hole saw was used to fashion the openings where two lights would be affixed on each of the three stairs. Once the lights were sufficiently tested, it was time to move on to top-decking. 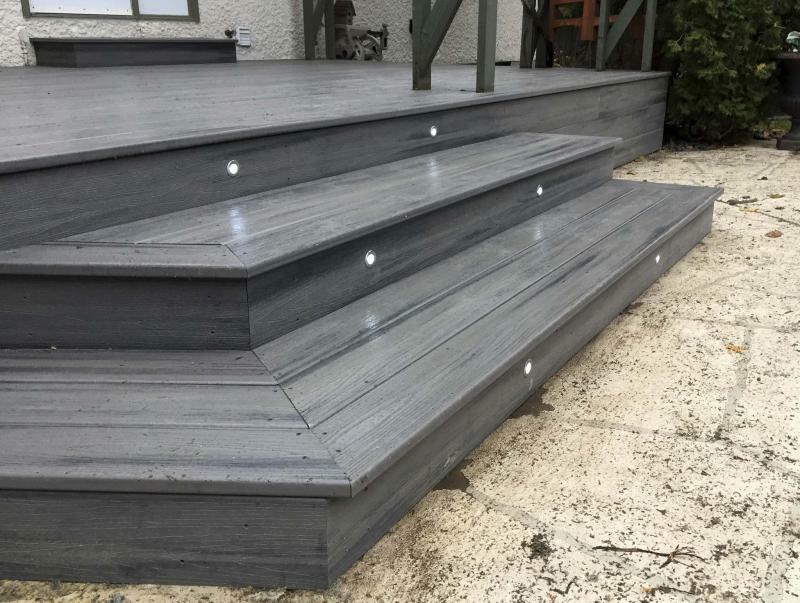 Two-by-six TREX top-decking in the matching grey colour were used on all the top surfaces of the deck and stairs. To avoid unfinished ends of TREX protruding from the long sides of the boards, the entire deck was picture-framed along the perimeter of the main deck surface, as well as on each stair, by mitering the boards at every corner. Although I had to work around two existing trellis features on the deck being recycled, the job presented no unforeseen obstacles and was completed in less than two days. It was a very fun project, and I’m thankful Wyllie chose me to do it. To me, loyalty and accountability matter most. I count on suppliers to provide me with what I need. And if something goes wrong along the way, I expect them to find a way to make it right. Over many years and countless jobs, trust and respect towards my suppliers has grown exponentially — I count on them to help me get the job done. It is nice that a supplier chose to count on me to get a job done, too!